I experienced a “confluence” of sorts this morning as I gathered with fellow followers of the Way and God seekers to discuss the end of the book of Luke. We watched a short video created by Dan Stevers called True and Better. It brought tears to my eyes. The past 9 months of walking through the bible exploring bible passages related to water has taught me that the video’s premise, that the bible is not a set of disconnected stories, has been true in my experience as well. All the disparate and seemingly disconnected stories tell of a God who carries us like a son or daughter and was crucified on a cross for us. The Old testament is filled with Reflections of Him. As a geology professor I get to teach people about rivers — one of my favorite subjects. We learn that rivers come in two “flavors”, meandering rivers like the Mississippi River, and braided rivers like the Brahmaputra River in Bangladesh. Braided rivers have many channels that change often and meandering rivers typically have one main channel that slowly meanders around its floodplain. If you were to cross a braided river you would have to wade through many channels, and if you came back a day later you might be wading across different channels. The scientific reason why rivers have a braided form is because they are attempting to carry more sediment (rocks, gravel, sand, silt) than the water they contain can carry. 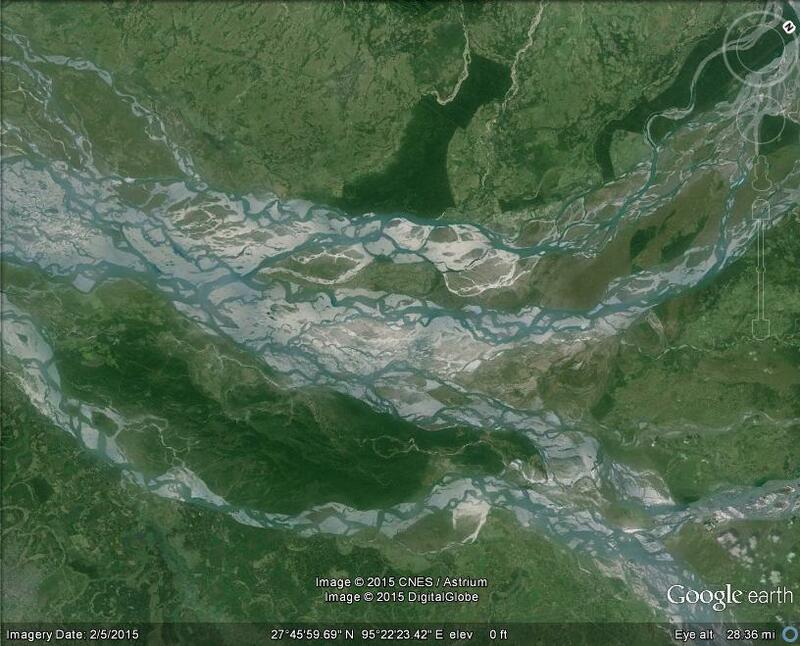 The end result is that the sediments build up and the river must move to a new Chanel to flow…thus the braiding. The bible is like a braided river…many channels…one river. In the case of the bible the “sediment” is the rich and dense spiritual truths that are embedded deeply in many of the stories and psalms. I think in a strange way there is almost too much spiritual load for the bible to carry, or at least for us to comprehend at times. The very medium of our earthly existence and lives is not capable of carrying or processing some of these spiritual truths. We must learn about these truth through our own experience and through accounts of sometimes perplexing people in the bible who came before us. The inclusion of these difficult to understand parts of the bible is a feature not a flaw. It allows deep spiritual streams to coexist and meet the reader where they are at spiritually. That is why the same story or verse can hold different spiritual meaning depending on when and how we read them. We return to the same river yet we can experience different streams — just like a braided river. The streams all originate from the same place and flow to the same ocean, but the ways they get there are changing and dynamic. That is why something as seemingly bizarre as prohibitions against weasels, rats, and geckos can coexist with the awesome tenderness and quiet waters of Psalm 23. The dysfunction and decadence of King David is connected to the divinity of Christ. The end result is a complex tapestry of interwoven spiritual streams that are all part of the same braided river…the One River…God. If we focus on just one channel at the exclusion of the others we may miss important connections and continuity. We may also erroneously think that the biblical “stream” we are reading can be understood in isolation, when in fact it is part of a larger river. I am looking forward to arriving at the “confluence” of streams that will occur when I reach the new testament and the arrival of Jesus, but I am gaining a deeper appreciation for the “braided” parts of the Bible too. Prayer: God thank You for providing spiritual truths in a form that we can comprehend through the veil that separates us. This entry was posted in Christian Community, Christianity, Discernment, Following God, Free Will, Life Together, Rabbit Trails, The Earthly Realm, The Nature of God, The Spiritual Realm, Trusting God, Wisdom and tagged braided river, river, water. Bookmark the permalink.